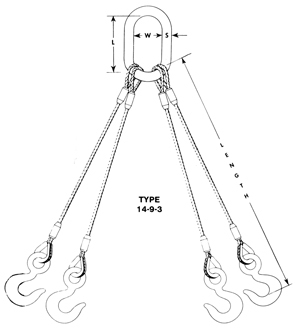 EXAMPLE: For a 4-leg bridle sling, with shackles attached each leg, rated capacity of 14 tons at 60°, 10 ft. long. ORDER: One — 5/8″ diameter Type 14-9-4, 10 ft. long. 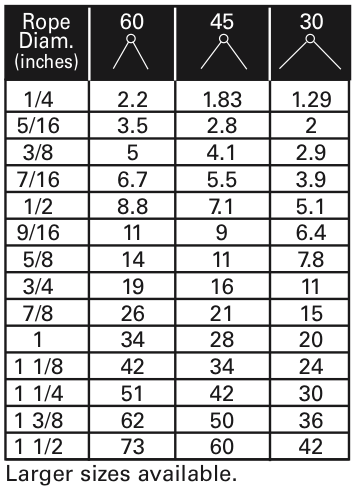 Type 14-9 slings are 4-leg All-Purpose bridles, used both for balanced and unbalanced loads and for heavier loads where design calls for / more distribution of weight by the use of attachment at four points.